As governments pass into young hands in one Sunni Arab nation after another, it is not surprising to find a resurgent al Qaeda dipping into the young generation for its next emir. Osama bin Laden’s favorite son Hamza, now in his 20s, is beginning to be tagged as the radical Islamic movement’s leader-in-waiting. A new book by Ali Soufan soon to be published (Anatomy of Terror: From the Death of Bin Laden to the Rise of the Islamic State) highlights his qualifications and offers intriguing revelations about his background. This rising talent is also recognized by none other than the US State Department, which in January 2017 placed Hamza Bin Laden on its list of Specially Designated Global Terrorists. Six years after the death of the terrorist who ordered the 9/11 attacks on the United States, his son Hamza called for a new jihad to save Syria from the Assad regime. “The cause of Syria is the cause of the entire worldwide Muslim community,” he said in an audio recording released on September 16, 2017 on jihadist networks. “In order for the people of Syria to resist the Crusader, Shiite and international aggression, Muslims — all Muslims — must stand with them, support them and give them victory,” he said. 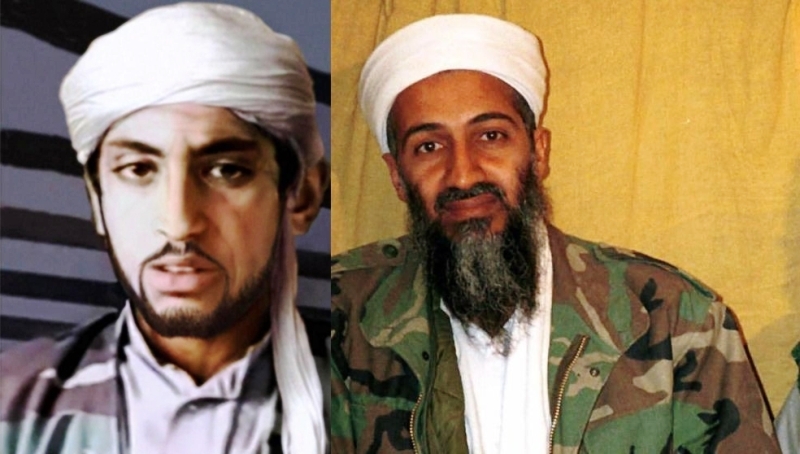 Osama’s young son had a privileged childhood in that his mother, Khairia Sabar, his father’s fourth and favorite wife, was a trained child psychologist from the respected al-Hindi family of Saudi Arabia. Osama married her at the insistence of his first wife, who wanted her to care for his other children, some of whom suffered from developmental disorders. When his other wives abandoned during the hard years of life on the run, Khairia stayed with him to the end. In the fall of 2001, they were given temporary sanctuary, in all places, at the world’s foremost Shiite bastion, Iran, where a key Bin Laden aide, the Egyptian Saif al-Adl, was running a secret network of safe houses, with the knowledge of Iranian regime. For the next few years, Soufan describes Khairia as using their segregation from the outer world to have Hamza schooled in “Qur’anic study, Islamic jurisprudence, and the hadith (alleged deeds and sayings of the prophet).” While in captivity, he grew up and married the daughter of one of his teachers, the longtime al-Qaeda military commander Abu Mohammed al-Masri. In August 2010, thoroughly immersed in jihadist doctrine, Hamza was released along with his mother, wife, and children. They made their way to Waziristan, where a sizable al-Qaeda contingent lived under the protection of various Pakistani militant groups. A year later, In May 2011, Osama bin Laden was hunted down and shot dead by an American Seal force in a hideout near a Pakistani military academy in Abbottabad. Today, with ISIS losing its strongholds in Syria and Iraq, Al Qaeda and its affiliates are resurgent. The Syrian affiliate, the Nusra Front (renamed Hayat Tahrir al-Sham) numbers more than 20,000 fighters. Al Qaeda in the Arabian Peninsula (AQAP) occupies strategic stretches of Yemen’s coastline, while Al Qaeda in the Maghreb (AQAM) has absorbed several other Islamist factions in Africa and is on the offensive. Hamza has set his mind on more attacks on US soil and has nothing but high praise for former atrocities. Borrowing his father’s anti-American rhetoric, he accuses the US of “occupying” the Arabian Peninsula and “stealing” Muslim wealth.